Recently, games such as Halo: The Master Chief Collection and Assassin's Creed: Unity have been released with sub-par launches. Some games have launched with patches ready, and for other games it has taken up to a couple of weeks for much needed patches to be released. Even after getting these, the games still have major bugs that have yet to be fixed. Halo is one of the most successful and widely known game series in the world, selling over 60 million copies of its games and bringing in about $3.4 billion. With something as big as bringing the Halo series back to life on a next generation console, as well as remastering the first two games in the series, you would think it would be an instant success for Microsoft. Unfortunately, this was not the case. The 20GB day one patch brought fans a huge disappointment, as loading times for some people reached over 12 hours. While downloading the multiplayer patch, players were also cut off from playing the campaign as the patch was affecting that as well. This was later cut down to 15 GB but left gamers with another dilemma: How do I play multiplayer when it can take up to 20 minutes to find a match? The horrible bug after the update left many thousands out in the cold as nothing online would work. 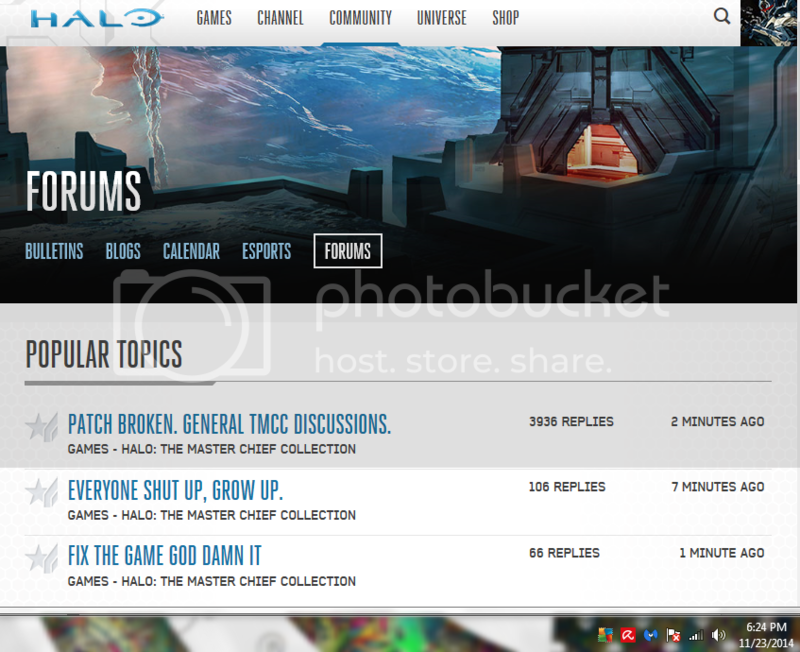 The Halo Waypoint forums were filled with fury as players posted their reactions to the non-functioning selling point of the award winning franchise, and posted thread titles such as these that made the front page in the image below. To top it off, achievements weren't unlocking, so when the community would take a break from matchmaking, the campaign would be broken too. You could play through mission after mission without any support from either Microsoft or 343 Industries to help you get your rewards. Deemed one of the worst launches of all time, what could 343 Industries do to fix it? Their solution was another 1 Gb patch. It didn't work as intended, and once again left players in uproar as the matchmaking system still didn't work. And achievements were still not unlocking as they should. In response, the community quickly took to the forums a second time to voice their anger. As you can see almost 900 replies in total in one thread about achievements not unlocking, in addition to the plethora of others not pictured. From what I've seen, there has always been a following of the Assassin's Creed games, but this time Ubisoft's flagship game is not doing well. With its 40+ hours of campaign being broken, it makes for another setback in the gaming community, as it makes you rather want to get the previous Assassin's Creed title. It's supposed to leave the player wanting more, but instead it's a reminiscent of a game that by many is regarded to be the worst video game launch of all times, Battlefield 4. For over 3 months players had to wait in a nearly broken game with more or less no functioning support. It leaves a nasty taste in your mouth, as a lot of gamers come from a time without patches, meaning that games didn't leave the studio unless they were golden, polished and ready for launch. Where is the industry going when games are released unfinished, letting gamers believe that "ship it first, patch it later" is the strategy they are going by? Surely that isn't what the developers are trying to do, but it's what gamers are feeling when they try to log in to their games, noticing that more and more flagship titles are broken on launch. Here's to hoping this doesn't become a trend because I personally, along with thousands upon thousands of people know the sting of getting a new game and not being able to play because of major issues. In a world where a launch can make or break a company, where do you think the industry will end up when you must wait hours to download a quick fix that may or may not work at all? I surely want my copy of Halo: The Master Chief Collection to work along with Assassin's Creed: Unity, but at this point I cannot get around spending a lot of my time just to find that the game is broken. I've already spent a number of hours on Halo and felt the horrid feeling of not having my achievements unlock. That coupled with a lagging multiplayer that takes up to half an hour to provide a match, makes me want to play the game less and less, even if the game was patched correctly. Game refunds are on the rise as many players are disappointed. I'll stick it out and wait for it to be fixed, but how will this impact the next Halo or Assassin's Creed games? Hopefully it doesn't happen again. This story is a tribute to all gamers who spent time in Halo or any buggy game and it didn't work right.